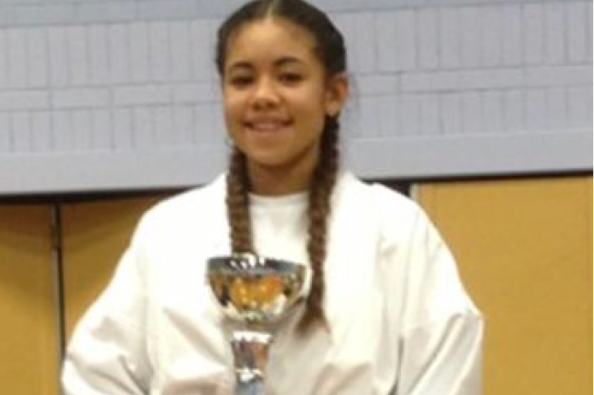 Next Monday we're running an extra special Bootcamp to raise funds for my niece Chynah, who's been selected to represent England at the World Karate Championships in Japan, August 2015. Bring home a medal for England Chynah! This is such a fantastic achievement and opportunity, however in order to go, she needs to raise around £1500. As Karate is yet to become an Olympic sport, there is no funding available for the team so the individuals have to pay the cost of flights and accommodation themselves. We'd like to help by donating the proceeds of this Bootcamp to Chynah's fund and wish her all the best from the sisterhood 'Up North'. The cost of the class will remain at £5 and we'll accept donations on the night if you'd like to contribute any more. There will be a strict 30 people max in this session but I will be happy to get 20 confirmed places. Please let me know via text, email, facebook or by talking to me at the gym if you want to join us for this Bootcamp. Members please note: I will be asking for £5 cash for this class even if you are a paid up monthly member or hold an 8 session card. Thanks for your support so far and kind donations already made by some of you. If you'd like to make a donation directly to Chynah's fund, visit her go fund me page. See you at BRUCE LEE BOOTCAMP next week!